Rita van der Veen holds a BSc in supply chain management, as well as a master's degree in Business Administration. She began her career in 1989 at CSC Index in London, where she was project manager for complex change efforts in corporations across Europe and the United States. In 1994 she moved into a line function in supply chain management at Ciba, later Novartis, in Basle, Switzerland. After a two year period as an independent consultant in Switzerland, she moved back to the Netherlands with her husband in 1999, where she continued her consulting activities, while studying organisational psychology at the University of Utrecht. Rita van der Veen is an effective facilitator, who works with senior management teams on alignment issues and coaches project teams to formulate and achieve ambitious goals. As a trainer she motivates individuals and teams to improve effectiveness. 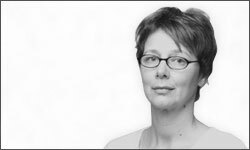 She has worked with Martin Herrmann since 1992 and later also co-developed the ChallengeX Method. Her clients include numerous chemical and pharmaceutical companies in Europe, leading manufacturers in the automotive industry and IT providers.